I am a DOG LOVER, as far as I can remember I always shared my life with dogs. As a child my soul mate was an English Cocker Spaniel. I am an old breeder, I have been breeding Cavaliers for more than 25 years now and made 21 Champions de France. I love four colors but my favorite are wholecolors. Some years ago it seemed to me that becoming an FCI Judge would be a good way to stay in the world of dogs and keep an eye on the breed as well if... someday... I would stop breeding (which will happen of course)! I was lucky enough to judge many Specialties in France and already three times at the French Club Show itself and at the French Championship Show as well. I proud myself to have judged already in Germany, Estonia, Belgium, Sweden, Denmark, USA (Carmel CA) and (Matamoras PA), Finland, Italy, Australia, New Zealand and in France as well of course. It was my pleasure too, to be invited at the first Club Show of O.KA.E Cavalier King Charles Club of Greece. I will judge in Latvia next summer and in USA next October. 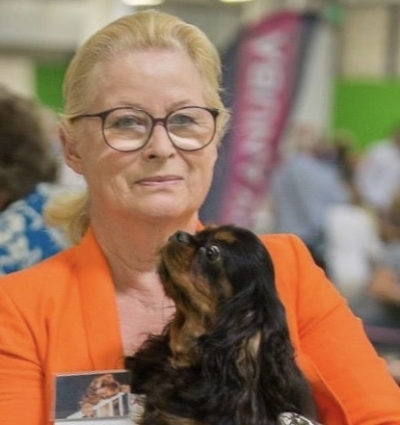 I am allowed to judge Cavalier King Charles, King Charles Spaniel, Poodles, Pekinese, Chins and Chihuahuas at International Shows. Last but not least, I have been happily married to Patrice for 51 years, I am lucky mother of 7 (six boys one girl) and proud grandmother of 15. I am looking forward to this very special time in your lovely country and I feel very honored to be invited to share with you this special event of your Club Show. I am looking forward to meeting you all and your lovely dogs.